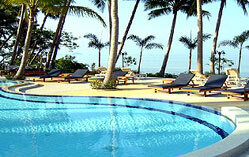 The beautiful sunset beach resort with 73 bungalows is located 20 minutes from Chaweng beach and 4 km. from Koh Samui island downtown. Free transfer is provided to Chaweng and downtown everyday. Bungalows are built in unique style with elegant thatched roofs. The interiors provide modern facilities for convenience. All bungalows have satellite TV, air-conditioner, mini-bar and telephone. 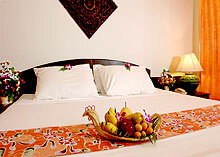 They have own balcony with pleasant views of the private flower garden, some rooms with sunset sea view. Enjoy specially prepared healthy food, low fat and low cholesterol food made from fresh herbs and spices, olive oil, vegetable oil, and low sodium content. Vegetarian and non-meat menu dishes can be selected from our "Special Health Cuisine Menu". 27 bungalows of 30.25 square meter floor area with either double or twin beds, and good-sized bathroom. 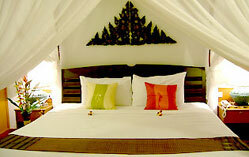 All rooms have own balcony where guests can sit and enjoy views of the private flower garden and coconut trees. Individually controlled air conditioner, IDD telephone, satellite TV, a mini bar, slippers, private balcony. 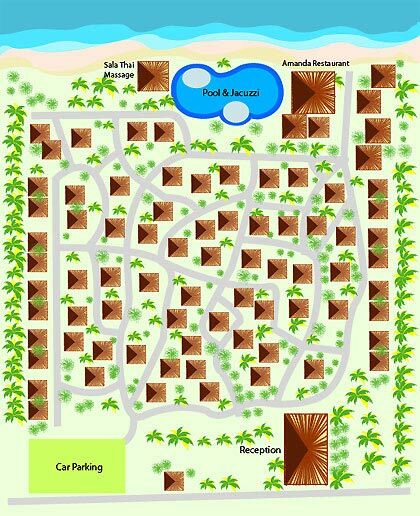 33 bungalows of 30.25 square meters floor area with either double or twin beds, and good size shower room. Individually controlled air conditioner, IDD telephone, satellite TV, a mini bar, slippers, private balcony, tea and coffee making facilities. 10 bungalows of 35.75 square meters floor area, mostly witht double beds, and large size bathroom. All have own balcony and setting around the swimming pool so that guests can enjoy views of clear blue water in the pool, sea and the private flower garden altogether. 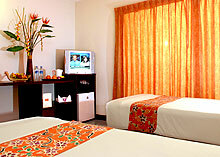 Some rooms are located at beachfront providing sunset scene. Individually controlled air conditioner, IDD telephones, satellite TV, a mini bar, slippers, private balcony, tea and coffee making facilities, hair dryer, bathrobes.